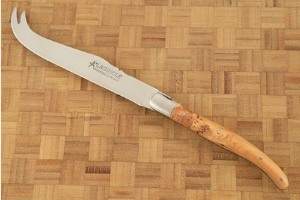 This beautiful cheese knife is expertly crafted. 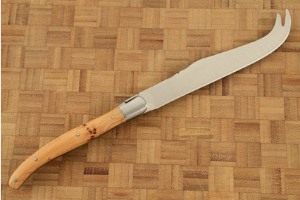 The blade is hand forged and hand finished, and features both a keen edge for slicing cheese and a forked tip for picking it up. The signature shepherd’s cross is inlaid into the juniper scales, and the traditional Laguiole bee is solid steel and forged into the spine. 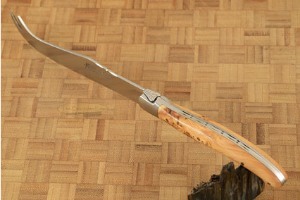 The whole spring, bee, and part of the knife spine are hand chased with a file in a pattern unique to the knife. 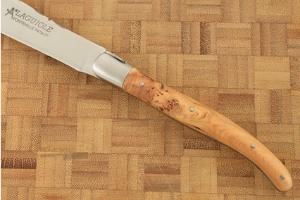 The juniper wood scales are accented with brushed stainless steel bolsters. This beautiful cheese knife comes in a beautifully finished oak presentation box, ensuring that the piece will not only be superb when used in the kitchen, but will delight your guests at the dinner table. Also included is a certificate of authenticity. 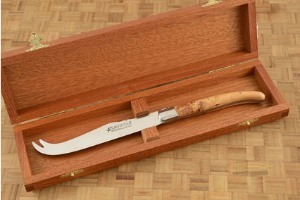 This makes a wonderful gift that will last a lifetime! 0.0390625 0.03125 39.0625 31.25 Header Started. 0.1328125 0.03125 132.8125 31.25 Trailer Started. 0.28125 0.1484375 281.25 148.4375 Trailer Completed.